The Mossback Café has a cookbook! Hopefully you all remember my review of The Fever by Thomas Fenske. If not, click here and read it, and then click here and buy a copy and read it yourself! There’s a second book, too, A Curse that Bites Deep, that I have on my Kindle and haven’t yet finished (see my previous post – I haven’t been reading, so sad), though I’m sure is as excellent as the first. In any case, now that you’re reacquainted with the books – some exciting news: the lovely Mossback Café, which plays an important role in the books, has a COOKBOOK! I was so excited when I learned about it that I downloaded it immediately and read it straight through in one sitting. My husband asked me, somewhat incredulously, “You’re reading a cookbook?” Technically, yes, but in the author’s words, it’s so much more than a cookbook! 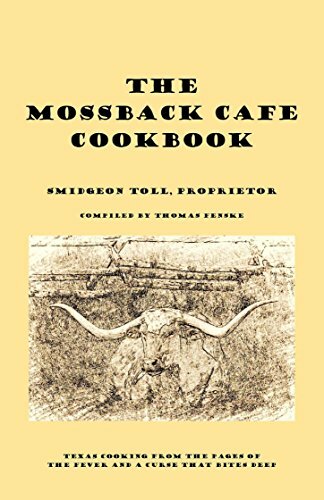 The Mossback Café Cookbook is “compiled” by Thomas Fenske, writing in the voice of Smidgeon Toll, a character from the books. It’s a treasure of Texas-style cooking that I’m sure will go over well in my house (well, at least with my husband…) when I have a chance to try the recipes out. Having read The Fever, and looking forward to restarting A Curse that Bites Deep, it was a lot of fun to learn more about Smidgeon and the Mossback Café from Smidgeon’s perspective. I smiled throughout, and it definitely rekindled my desire to pick up A Curse that Bites Deep again soon. I can’t see how anyone would read the cookbook (check it out! only $.99!) and not want to read the books themselves, so even without trying the recipes I call the cookbook a great success. And I can’t wait to try out the homemade chorizo! The Buttermilk Pie is sublime and there is a good treatise on biscuits and pimento cheese and, and, and. Give it a try! I want readers to know that THE MOSSBACK CAFE COOKBOOK is now *mostly* FREE! It’s stll 99 cents at Amazon (trying to get them to price match) but there is a free kindle version (mobi) at Smashwords.